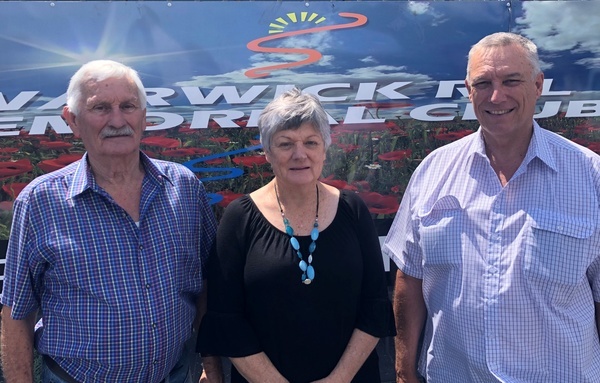 From left: Senior Vice President Harry Liaubon, Junior Vice President Lorraine Dent and President Peter Kemp are among the members of the Warwick RSL Memorial Club’s 2019-2020 management committee elected at last night’s AGM. The Warwick RSL Memorial Club has a new management committee for 2019-2020 following its annual general meeting held last night, Tuesday 26 March. The new committee replaces an interim management committee elected at a special meeting of members in January with the aim of improving the club’s financial position. Since that time external consultants have been brought in to assist the club with making major changes to its operations and an interim general manager, Andrew Bowtell, recently commenced in his role while recruitment for a permanent general manager is completed. •	Night out for Drought – The Warwick Lions Club in conjunction with the Warwick RSL are holding a fundraiser to help support our local farmers. A ‘Night out for Drought’ will be held in King’s Theatre this Saturday 30 March from 6.30pm. There will be trivia, a cent sale, live entertainment and plenty of wonderful prizes to be won. Entry is $10 per head and people are encouraged to book their tables now by phoning Clare on 0427 613 719.